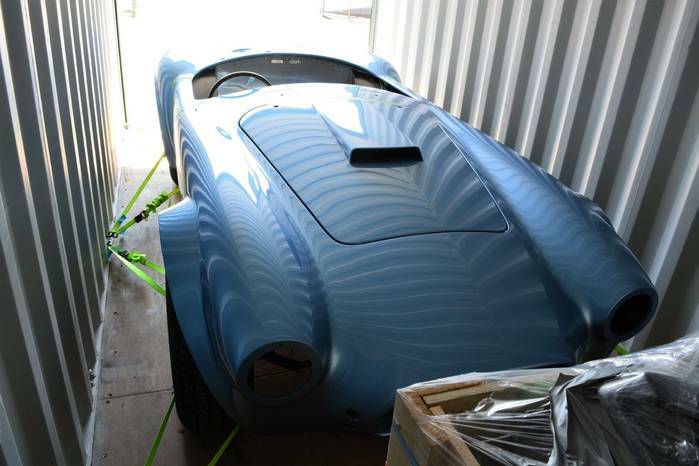 My car, AP F289, finally arrived a few weeks ago as a painted “rolling/steering” chassis/body. It took two and a half years - there was significant development work involved in taking one of Bruce Chervenak’s very good FIA rear clips and a roadster front clip up to the standard where AP could use it to produce a quality splash mould for subsequent FIA replicas. Craig White’s guys have done an excellent job in producing a top quality FIA replica. One of the cars that have given me ideas and inspiration for my build is COB6008. It is one of the few original Cobras that left the AC factory with FIA rear flares and cut-back doors as part of their original build spec., and it may well be the only ‘cut-back doors’ car to also have RHD and drop-centre dash. My car and its boxes of bits came by road and rail from Queensland to Adelaide. Anglia Containers did the job and get full marks from me. Watching that container tilt close to 30 degrees before it overcame friction was unnerving…. Now the fun bit starts. boxhead, mate, albanycobra and 7 others like this. Two and a half years, you are a patient man, but good things come to those who wait. Very well worth the wait indeed, as PACE has done a splendid job. I suspect you will be spending a lot of time in your garage, in the coming months. The wait is finally over, now it's your turn. You'd be about done right? Cmon man I'm dying here... I'm looking forward to popping the champagne on this one. I know how you've pined over every detail! ....You'd be about done right? You've got to have the masses craving for more rather than flooding them with too much information. Translation.....umm...quality rather than quantity....how's that? Seats are being upholstered. Here’s what they look like part way through…. Looking nice. It is nice to be able to start checking things off your to do list. Can't wait to hear more about your build and watch it's progress. Seats are finished. We have done a minor deviation from standard with the addition of a ‘pillow’ at the front of the seat. The rest is as close as we could get to pictures of original seats. The seats look nice and that pillow in the front will come in handy on long drives. Will make them more comfortable. Sometimes we must make exceptions, even originals had little changes along the way to meet owner needs. Keep up the high quality work. It’s been awhile since last posting an update on my 289FIA build. The normal reasons for delays apply (ie work commitments etc) but I’ve been trying to get out to the garage at least a couple of times a week. Currently working on the roll-over bar installation. I have had the bar and strut powder coated; I’ve removed the mounting sockets and drilled the sockets and bar legs in conjunction, and remounted the sockets. The bar legs have sprung out by more than 15mm so will have to pull them back in to be able to fit the bar. Also have been working on the dashboard. I’ve done a mock-up in mdf and am making ‘adjustments’ to it and to my original CAD model. So, no dramatic pictures to post, but there are things slowly happening on AP2289. Nice to hear that things are still moving forward. I imagine that most people who build their cars find that it takes a lot longer than what they expected. I know that when my father would give an estimate of how long we would have to work on a project with him, my brothers and I would multiply that timeframe by 4. ....multiply that timeframe by 4. Still working on the roll-over bar install, but not going smoothly. As mentioned, legs had sprung out somewhat, so had to deal with that. I wanted to use grommets as per originals, and managed to finally source what I think are correct grommets, but the holes in the body need so much adjustment to allow the bar to be fitted that I think the grommets are out. 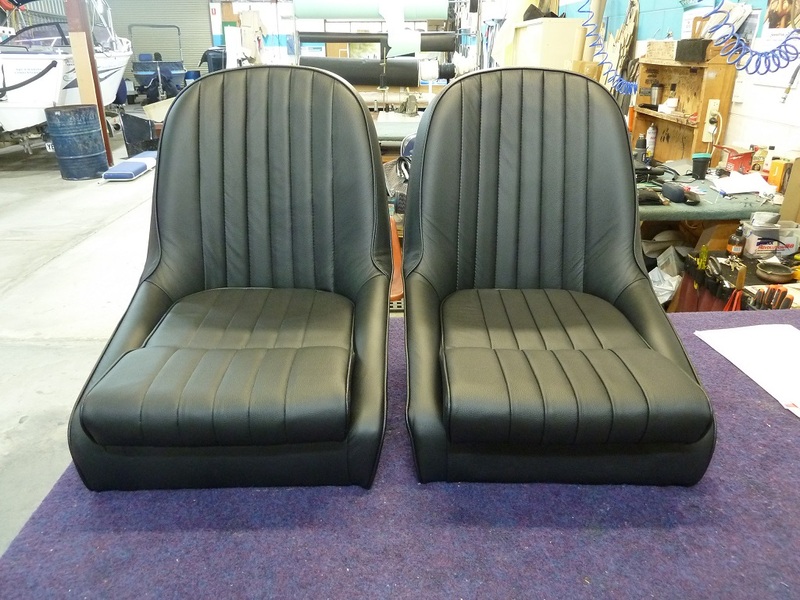 Luckily I saved enough leather from the same hides as the seats, so have that aspect 'covered'. Steering shaft location is different to originals, but I'm happy enough with the adjustments I've had to make. LoBelly and 1795 like this. Coming along nicely. I doubt that there is a cobra build out there that did not need some adjustments. The hole for the outside leg of the roll bar does look a little tight. Not sure how to open it up for a grommet without either making a poor cut or having to remove the roll bar. given the effort that it took to get the roll bar in, I would suggest that you do without the grommets. If you have a spare set of grommets, you could try to cut away at the bottom of one and see if there is enough material left to still secure it from the underside. It looks like there might be enough space on the inner leg to place a grommet. Or maybe even cut off the underside of the grommet and use a little RTV around the inner aspect of the grommet to secure it to the roll bar in place? I had some grommets made by a fella in the states they come up really nice im happy to lend them to you to see if they fit your car ok ? Thanks for the offer Dean, and Jim for the suggestions. 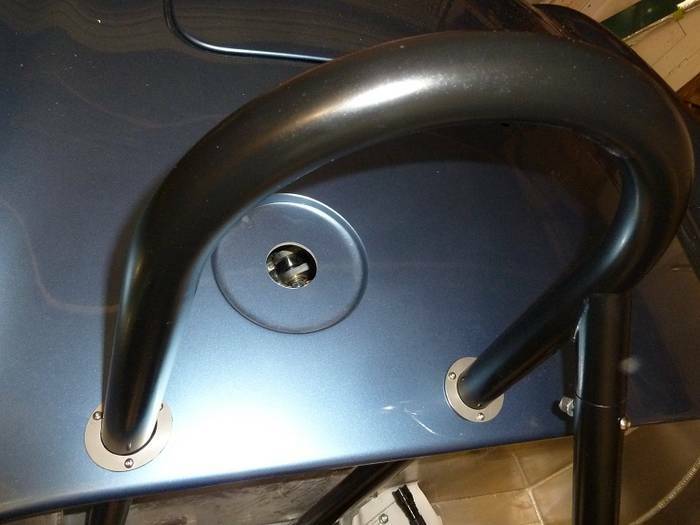 I did actually find some grommets that I thought would work (they were designed to fit a 1/4" thick panel, and surprisingly, sourced here in Adelaide) but my main problem was that the holes in the bodywork were incorrectly positioned ....one was too far forward and the other was too far aft. Result was - no amount of available juggling would enable me to use the grommets without gaps showing. I hadn't wanted to use the supplied SS 'washers', but had to concede that their use was my only option. Even still, one washer-securing screw and nyloc out of three for each leg is hanging in the breeze (but you can't see it, and it doesn't matter). The end result is visually quite good - I'll take a pic of it tomorrow and post it here. Last edited by xb-60; 06-18-2017 at 03:26 AM.. I was at the local shopping centre recently, and there was a Maserati Ghibli on display there. This was the first example I had actually seen in the metal, so I had a good look (what a great looking car!). One of the options listed for this particular car was something special about the paint, so I had a close look at that. I have to say that the amount of orange peel evident was surprising, and compared to the beautiful smooth and consistent finish on my FIA (that was done by a Gold Coast boatyard ), the Ghibli did not rate that well. Got to say though....what a great looking car! Finally got the roll bar install to the point where I am happy with it. I reckon it took 20 hours ( ) to get it right. Every thing is all bolted down tight....and it's not coming out again. boxhead and BJ's Snake like this.